With this project wrapping up and the spring semester approaching I find myself daydreaming about dedicating a year to my mobile project. My schedule was thrown out of whack but I can make the most of it. I was planning on having a really easy semester as my last at school but thanks to my rewrite I'll be doing most of that this spring instead. I was planning on dedicating lots of time to a certain couple classes I'm dreading but I can use the free time to get my next game out faster instead. I have a feeling that once I start my turn-based RPG I'll rocket through development on passion fuel. I've been itching to do it for a year now, even years if you count my first attempt at making a game (a dead project called Pokemon Adventure written in C++). If I'm as productive as I'm predicting I can have it out late November of next year at the earliest. 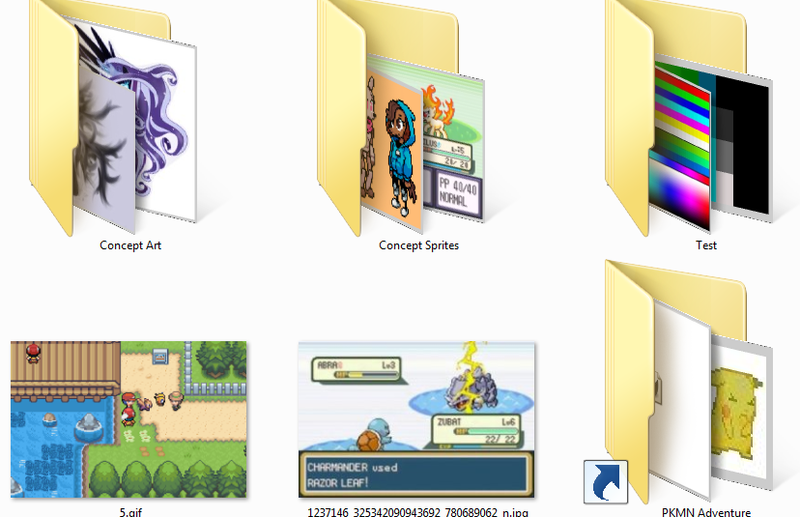 As you can see above I've kept all the leftovers from my first Pokemon project and saved anything inspiring me for the new one. That includes a few mock ups I put together when I couldn't contain myself. I'm really eager to put everything I have into it as soon as Unicorn Training is done for good.